It’s a separate sort of plants of the family of Vitaceae. 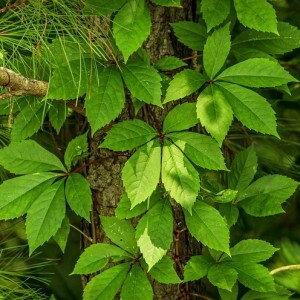 Change of a sequence of two words of which the Russian name of a sort consists, seems seemingly natural: "Boston ivy". However, it is unacceptable, because that will automatically shift the types belonging to it (there are about one dozen of sorts) in other sort of the same family. A mistake is not so rough because distinctions between these two sorts – Parthenocissus and Vitis, are not so categorical. The plants of the described sort are perennials, bushes and climb by means of short moustaches. Short moustaches can branch and be twisted round a support and/or be thickened on the ends, turning into sticky small pillows, and "to stick" to it. Therefore 15 meters — not a limit of height for tenacious lianas. Winter hardiness and in general unpretentiousness allowed them "to accustom" long since to the Himalayas (one of types and is called — as Parthenocissus himalayana). Other areas of natural dwelling — East and Southeast Asia, North America. North American types are seven - and five-leaved. Asian — five - three - and one-leaved. Boston ivy cultivation. All about plant.